Dispensaries are popping up all over California. Some 55+ communities are home to groups that take trips to nearby shops. All across the country, recreational and medical cannabis is redefining the way that many people treat their conditions, minimize pain, and simply relax. It is currently legal to use cannabis recreationally in nine states (plus D.C.) and it’s also decriminalized in 13 more states. However, California remains near the forefront when it comes to the normalization of cannabis use. That’s especially true for active adults. 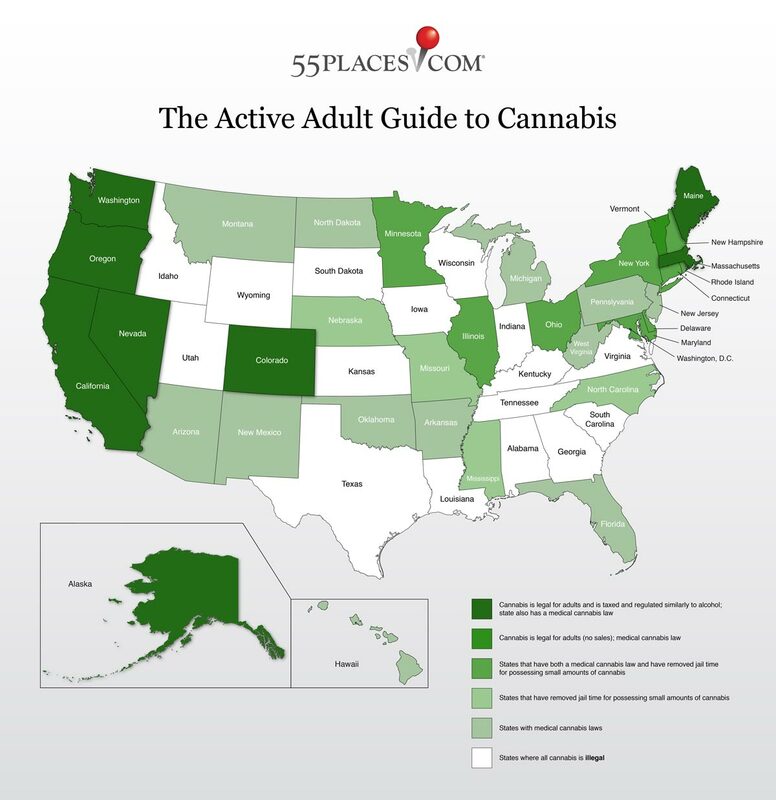 The 55 and over demographic is the fastest-growing demographic when it comes to marijuana use, increasing by 53 percent between 2013 and 2014 according to one study. In another, it noted a 71 percent increase in cannabis use among those 50 and older between 2006 and 2016. That trend is currently playing out in some active adult communities across the state. While acceptance remains case-by-case, residents in these communities are exploring the possibilities that come with cannabis use and set the tone for potential residents looking to live somewhere where they can partake as well. Here are five communities for cannabis users to consider. Recreational marijuana is now legal in 13 states plus D.C., while more states are looking to follow this November. Resident Mary Lou Molinaro had been using various drugs to treat pain for years before giving cannabis a try. 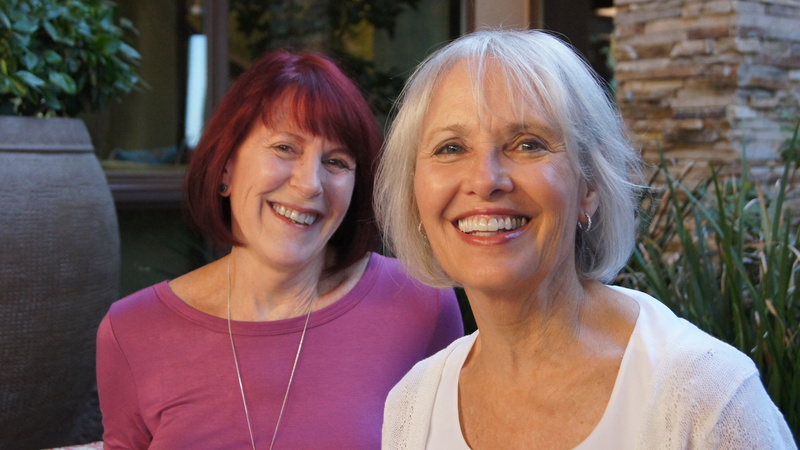 Impressed with the results, she and fellow resident Kyle Johnson, who uses it to treat back pain and insomnia, started the Cannabis Discussion Club in Trilogy at the Vineyards. Approved in May, the club meets monthly to provide residents with “educational opportunities to explore the multitude of ailments that can be treated with cannabis,” according to Molinaro. So far they’ve hosted speakers from around the Bay Area, including reps from cannabis product provider Octavia Wellness, a holistic veterinarian on treating pets, and even a certified master gardener on how to grow your own cannabis plants (California allows residents to grow up to six plants indoors). Kyle Johnson and Mary Lou Molinaro are leading the charge for cannabis use in Trilogy at the Vineyards. There are no dispensaries in Brentwood, something Molinaro says she hopes to engage with the city council about. So for now, residents have to travel to Vallejo, Berkeley, or Oakland to get products. Oakmont Village is a 55+ community set in the middle of Sonoma County wine country but this 3,300-residence community could also become a major point in the region’s cannabis country. Oakmont already has a Cannabis Club that meets each month and invites speakers to talk on a wide range of topics involving the plant. What takes things up a notch is the possibility of a recreational and medicinal dispensary opening within the community. That plan has been met with plenty of pushback, but if approved the dispensary could provide lasting benefits to residents looking for alternatives to opioid medication. Rossmoor, located in Walnut Creek, is a 55+ community surrounded by hillsides and natural open spaces. It’s also home to the Medical Marijuana Education and Support Club, which has been going strong for over five years now. Once a month, the group, which has swelled to over 100 members, meets to learn about the history and medicinal properties of the plant as well as hear from guest speakers on a wide range of topics. Contra Costa County bans dispensaries but residents are able to get medical marijuana deliveries. 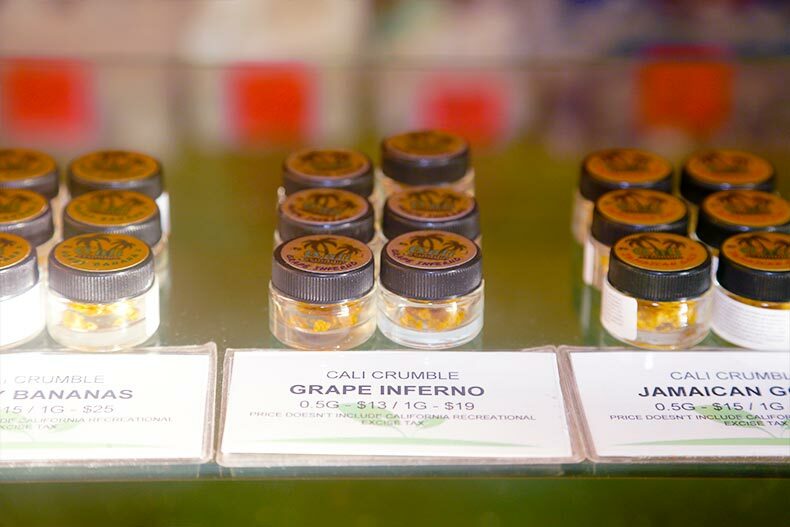 They can also take trips to nearby Bay Area locales that do allow dispensaries. The Villages Golf & Country Club in San Jose is a gated, 1,200-acre community located in the picturesque evergreen foothills of Santa Clara County. There’s also a lot of interest here in other types of green if the turnout from a recent cannabis presentation hosted by Octavia Wellness is any indication. There are plenty of dispensaries in the area as well for residents who want to take the next step. Airfield Supply Company and Haze are just two nearby. You don’t have to live in the Bay Area if you’re looking for a cannabis-friendly community. Laguna Woods Village in Orange County makes a pretty good case for consideration as well. This 12,736-home community boasts seven clubhouses, 36 holes of golf, five swimming pools, an equestrian center and over 250 clubs and organizations, so it’s already got a lot going for itself. One of those clubs is the Laguna Woods Medical Cannabis Club. Members of the club have been known to take a “cannabus” to Bud and Bloom dispensary in Santa Ana where they can ask questions, learn about products, and purchase what they want. Taking things to the next level is the arrival of NiaMedic, a healthcare clinic that focuses on medical cannabis treatments as part of a senior patient's conventional care. The clinic, which is opening in Laguna Woods soon, will be the first of its kind in the United States.